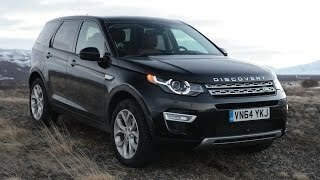 The all new member on Land Rover family, the Land Rover Discovery Sport 2015 prior to its release went through rounds of rumors, speculations and calculation but guess what, the wait is over and as a treat for you design is very much similar to the Discovery Vision Concept presented by the company. Not one or two but we have a huge line which will make this model irresistible for you and topping the notch is, its price tag. Yes Land Rover Discovery Sport will be at your doorstep for just $38,920. Sounds enthralling right!! Let us get to know more about this new release. Interior of Land Rover Discovery Sport 2015 offers you incredible 2+3+2 seating order. Highly spacious from inside Land Rover Discovery Sport is a pure sign of high class engineering. Luxurious cabin is adored with twin needle stitched leather work and metal trim glorifying your experience being inside. Innovative part includes multi zone climate control and configurable mood lighting to make this spacious and luxurious arena a comfortable space too to travel distances. If you are the one finding position for self in second row, you can recline the seats and make them according to your convenience however they can also be used to give some space to those seating in last row. For all three rows and people there-in multiple storage bins and cupholders are located, so need to create hustle inside in finding space for your drink or minute stuffs. 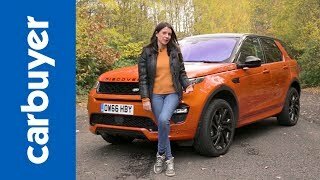 As we mentioned earlier, exterior of Land Rover Discovery Sport 2015 is very much mirror image of the vision concept we recently saw. 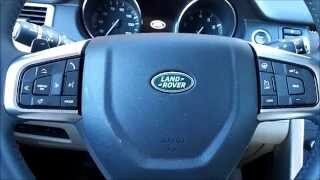 We also have a feeling that few of the new style features introduced here will carry the design philosophy of Land Rover in its future works. Starting with the front fascia of Discovery Sport 2015, it has traditional decent curved body portraying an all new grille between the HID headlamps and LED running lamps positioned in circular shape. In all it looks very attractive and when accompanied by the grille and body colored bumper which mounts fog lamps in it, the look you have is aggressively stylish. While the mesh grille carried ‘Land Rover’ logo we have ‘Discovery’ embossed on the front top of hood, which altogether narrates the saga of vehicle you are driving. 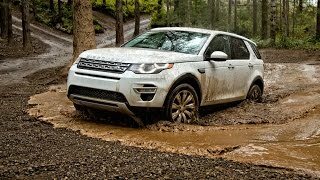 Land Rover Discovery Sport 2015 gets its power through a 2.0 Liter four-cylinder engine delivering total output of 240 hp and peak torque of 340 nm, paired to ZF 9HP48 nine-speed automatic transmission. 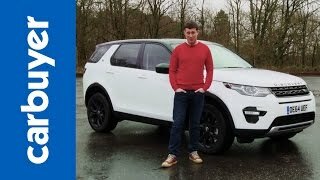 The entire setup enables Land Rover Discovery Sport 2015 to reach a top speed of 124 mph while the 0-60 mph sprint gets knocked in 7.8 seconds.